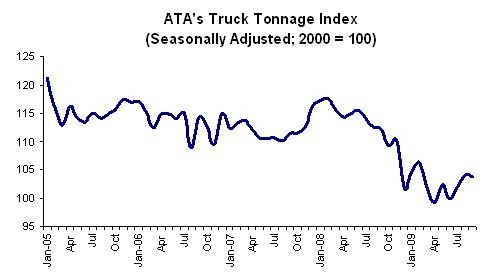 Compared with October 2008, SA tonnage fell 5.2 percent, which was the best year-over-year showing since November 2008. In September, the index was down 7.3 percent from a year earlier. The economy fell off a cliff in September October 2008, so the year-over-year comparisons are getting easier. And just like with other indicators, trucking appears to have recovered slightly from the bottom - and is now moving mostly sideways - and will likely remain stalled until there is pickup in domestic end demand.